Definition at line 121 of file name_cache.c. Definition at line 103 of file name_cache.c. Definition at line 1231 of file name_cache.c. Definition at line 42 of file name_cache.c. Definition at line 750 of file name_cache.c. Definition at line 45 of file name_cache.c. Definition at line 399 of file name_cache.c. Definition at line 373 of file name_cache.c. Definition at line 749 of file name_cache.c. Definition at line 36 of file name_cache.c. Definition at line 123 of file name_cache.c. Definition at line 166 of file name_cache.c. Referenced by name_cache_entry_update(), name_cache_unlink(), and nfs41_name_cache_delegreturn(). Definition at line 178 of file name_cache.c. Referenced by entry_invis(), and nfs41_attr_cache_lookup(). Definition at line 147 of file name_cache.c. Referenced by attr_cache_entry_deref(), and attr_cache_find_or_create(). Definition at line 157 of file name_cache.c. Referenced by attr_cache_find_or_create(), and name_cache_entry_update(). Definition at line 244 of file name_cache.c. Referenced by name_cache_entry_update(), and nfs41_name_cache_insert(). Definition at line 210 of file name_cache.c. Definition at line 186 of file name_cache.c. Definition at line 229 of file name_cache.c. Definition at line 219 of file name_cache.c. Referenced by attr_cache_find_or_create(), nfs41_attr_cache_lookup(), nfs41_attr_cache_update(), nfs41_name_cache_delegreturn(), and nfs41_name_cache_remove(). Definition at line 282 of file name_cache.c. Referenced by name_cache_entry_update(), nfs41_attr_cache_update(), and nfs41_name_cache_insert(). Definition at line 113 of file name_cache.c. Definition at line 329 of file name_cache.c. Referenced by nfs41_attr_cache_lookup(), and nfs41_name_cache_lookup(). Definition at line 814 of file name_cache.c. Definition at line 1327 of file name_cache.c. Definition at line 624 of file name_cache.c. Referenced by get_path_fhs(), and name_cache_lookup(). Definition at line 1233 of file name_cache.c. Definition at line 72 of file name_cache.c. Referenced by attr_cache_update(), name_cache_entry_update(), and nfs41_name_cache_insert(). Definition at line 1352 of file name_cache.c. Definition at line 401 of file name_cache.c. Referenced by nfs41_attr_cache_lookup(), nfs41_attr_cache_update(), nfs41_name_cache_delegreturn(), nfs41_name_cache_insert(), nfs41_name_cache_lookup(), nfs41_name_cache_remove(), nfs41_name_cache_remove_stale(), and nfs41_name_cache_rename(). Definition at line 492 of file name_cache.c. Definition at line 563 of file name_cache.c. 575 dprintf(NCLVL1, "name_cache_entry_changed('%s') has not changed. " 580 dprintf(NCLVL1, "name_cache_entry_changed('%s') has changed: was %llu, "
Referenced by nfs41_name_cache_insert(), nfs41_name_cache_remove(), and nfs41_name_cache_rename(). Definition at line 459 of file name_cache.c. Referenced by name_cache_find_or_create(), and nfs41_name_cache_insert(). Definition at line 587 of file name_cache.c. Definition at line 407 of file name_cache.c. Referenced by name_cache_entry_create(), and nfs41_name_cache_rename(). Definition at line 519 of file name_cache.c. Definition at line 510 of file name_cache.c. Referenced by name_cache_entry_changed(), name_cache_entry_update(), and nfs41_name_cache_delegreturn(). Definition at line 712 of file name_cache.c. Referenced by nfs41_name_cache_insert(), and nfs41_name_cache_rename(). Definition at line 696 of file name_cache.c. Referenced by name_cache_find_or_create(), and nfs41_name_cache_rename(). Definition at line 648 of file name_cache.c. Referenced by delete_stale_component(), get_path_fhs(), nfs41_name_cache_delegreturn(), nfs41_name_cache_insert(), nfs41_name_cache_lookup(), nfs41_name_cache_remove(), and nfs41_name_cache_rename(). Definition at line 416 of file name_cache.c. Referenced by name_cache_unlink(), and nfs41_name_cache_rename(). Definition at line 601 of file name_cache.c. 617 dprintf(NCLVL2, "<-- name_cache_search() "
Referenced by get_path_fhs(), name_cache_find_or_create(), name_cache_lookup(), and nfs41_name_cache_rename(). Definition at line 428 of file name_cache.c. Referenced by delete_stale_component(), name_cache_entry_create(), name_cache_entry_invalidate(), name_cache_unlink_children_recursive(), and nfs41_name_cache_rename(). Definition at line 450 of file name_cache.c. Referenced by name_cache_unlink(), nfs41_name_cache_remove(), and nfs41_name_cache_rename(). Definition at line 375 of file name_cache.c. Definition at line 859 of file name_cache.c. 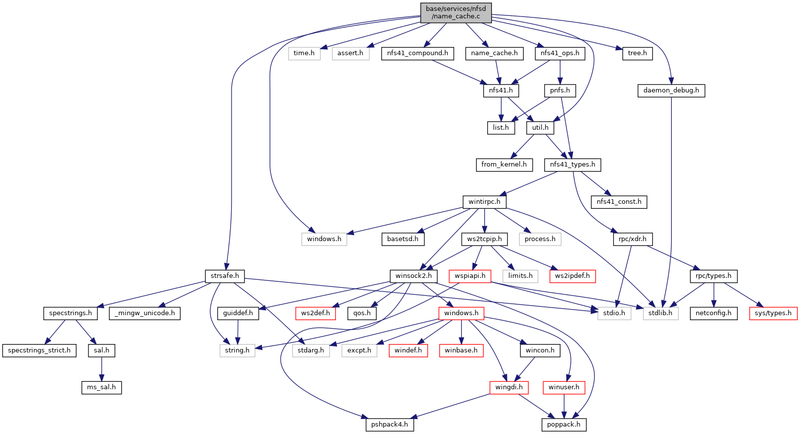 Referenced by nfs41_cached_getattr(), and nfs41_delegation_getattr(). Definition at line 891 of file name_cache.c. Referenced by nfs41_close(), nfs41_commit(), nfs41_create(), nfs41_getattr(), nfs41_link(), nfs41_remove(), nfs41_rename(), nfs41_setattr(), nfs41_write(), open_update_cache(), and pnfs_rpc_layoutcommit(). Definition at line 752 of file name_cache.c. Definition at line 1012 of file name_cache.c. Definition at line 796 of file name_cache.c. Definition at line 923 of file name_cache.c. Referenced by nfs41_create(), nfs41_link(), open_update_cache(), and server_lookup(). Definition at line 824 of file name_cache.c. Definition at line 1066 of file name_cache.c. Definition at line 1359 of file name_cache.c. Definition at line 1122 of file name_cache.c. 1151 dprintf(NCLVL1, "nfs41_name_cache_rename: adding negative cache "
1170 dprintf(NCLVL1, "nfs41_name_cache_rename: removing negative cache "
Definition at line 1283 of file name_cache.c.